Scope’s Innovation Manager John Scahill has seen plenty of change and transformation in his years with Scope. He says that even though the environment has changed, innovation has remained central to how Scope delivers its mission. “Innovation has always been important to Scope and will remain so into the future,” John says. “At Scope we aim to ‘Do it better’. This means, we keep asking ourselves how can we innovate and improve the way we do things. The NDIS transfers decision making from government and service providers to people with a disability, a game-changer for innovation at Scope and the disability sector. “We’re seeing more defined customer segments emerge due to a combination of customer need and interests, and what they choose to pay for. “As customer choice and control grows, I expect technology to feature more in the supports received by people with a disability. Scope combines good ideas and technology with 70 years of experience to create better outcomes for its customers. 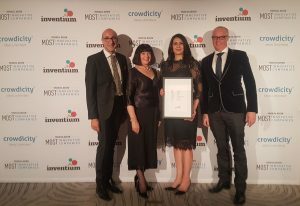 Dr Nick Hagiliassis, Dr Jennifer Fitzgerald, Dr Stella Koritsas, Brad Gurrie, CEO Socialsuite at the awards night. Scope has also launched Tools2Talk, an app designed by speech pathologists that allows people to make personalised communication aids, along with online training products such as the Disability Engagement eLearning course. “We’re also looking at ways to combine our experience in complex disability support with assistive technologies. We are collaborating with other organisations to connect customer needs and our expertise with technology.